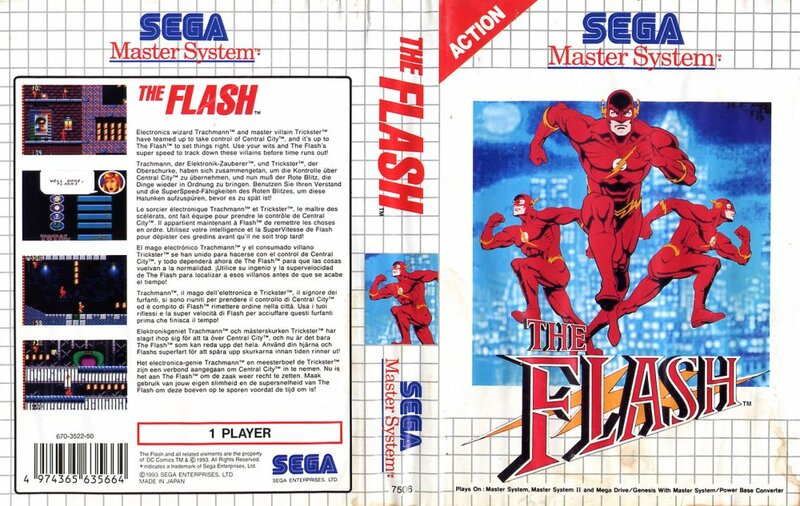 While most people remember the Genesis and later consoles from Sega, the Master System had a ton of great games. In the U.K. it was huge. 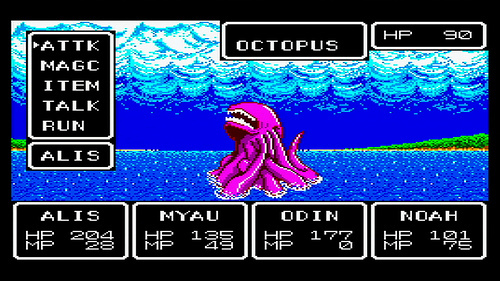 Here you can see our reviews for Sega Master System games. This is your classic RPG hands down. You can level up and have lots of fun. The game is turn-based so it requires some savvy strategy at times especially with the tougher monsters and boss fights. You will also spend lots of time grinding which is perfect for classic RPG fanatics! 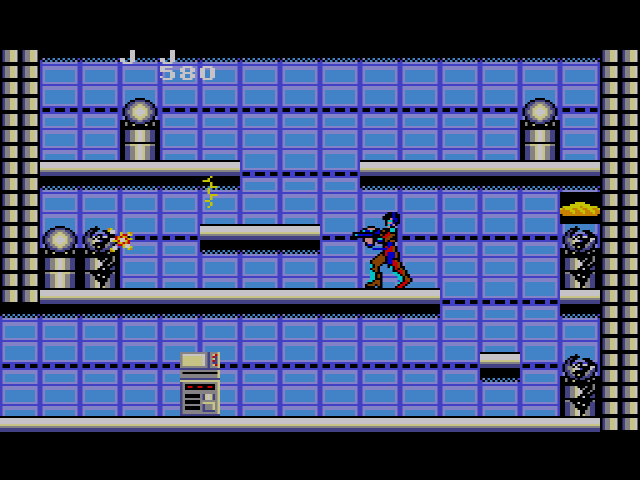 The graphics are quite good for a Master System game. Sonic looks like Sonic and not like a blob. The backgrounds and graphics of the stages are a hit. You never feel like you’ll jump into a fake wall or something. There isn’t that much distortion if there are too many things going on in the game so that’s a well deserved thumbs up. 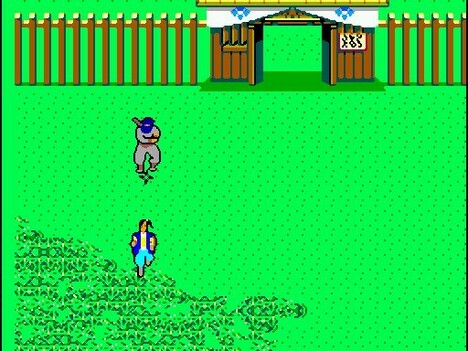 One of the coolest features of this game is Psycho’s ability to morph between fox, monkey, hippo, and tiger. However this is reliant that you have obtained a “Psycho Stick”, which can be found hidden away in the eggs that are scattered throughout the rounds or by killing an enemy creature. Of course each transformation has its strengths and weaknesses. Fox is the original form of Psycho Fox and his abilities such as walking, acceleration, punching power etc are standard. Okay, first off, the graphics are what you’d expect from a game on the Master System. Simple, yet effective for the given hardware there (granted I’ve seen decent graphics pulled off nicely on a Master System, I mean look at Sonic Chaos for example, or Fantasy Zone even! They’re very colorful games, Running Battle tends to go for blander colors. About halfway through the third stage a small frog comes a-leaping at you. As with any enemy, you prepare to unleash a kick. But unlike the other enemies, which are knocked back a little and destroyed when hit, when you kick a frog they fly like a missile across the screen, taking out any other enemies that appear in their path. It is one of the most hilarious things I have ever seen. Like many Japanese games, this one is based on an anime series, albeit a shortish and relatively unknown one, even in Japan. Both the anime and the game star a fellow called JJ who is a member of the medieval-sounding White Knights, a peacekeeping force who are out to destroy the evil Noza Empire’s base which is located on the 50’s sci-fi-sounding ‘Planet X’. 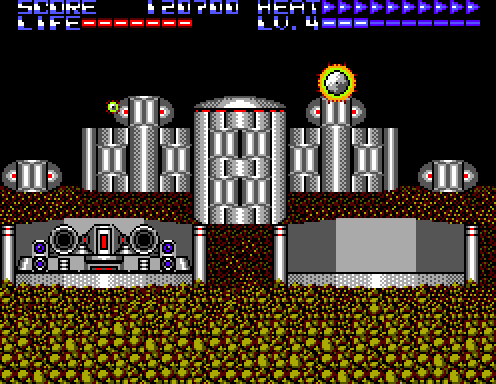 At the start of the game, the White Knight’s mothership has just landed on Planet X leaving JJ to infiltrate the underground base, rescue two captured comrades, and set the base’s mainframe computer to self-destruct. Sounds simple enough! Enemy strikes deplete Riki’s health-bar but this can be replenished by performing a high-jump (jump while squatting) to grab the icons that occasionally float along the top of the screen. As well as several types of food to refill your energy, there’s also a temporary shield, but they’re tricky to grab without taking any damage as the buffoons running backwards and forwards along the single-plane landscapes are infinite and quite quick too. They’re also pretty small, as is Riki himself. The level of detail isn’t too impressive on most sprites either but the mid and end-of-stage bosses are quite varied and a bit more detailed too. The weird faces the humans pull when you blast them with lead are amusing though. (the robot’s death animations are boring in comparison). It’s almost like the designers wanted you to shoot the wrong targets… You’re then given a ranking for how well you did (I performed badly, predictably), and whisked into the first stage proper. Things get ugly quickly. 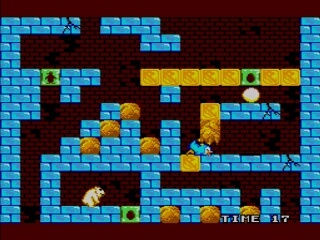 Enemies fly around in the air, and a robot (which the game has taught me is certainly an enemy) walks along the bottom. All of them are rather uninspired and blandly designed. I shoot away at them, and their death explosions are as equally dour. 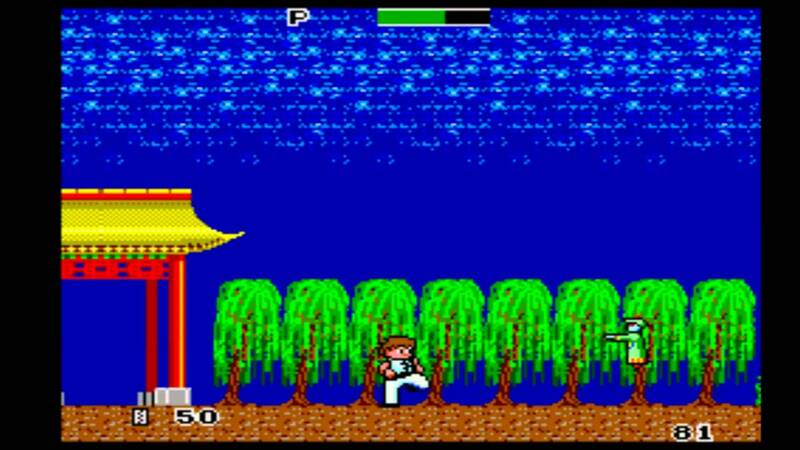 The gameplay consists of working your way upwards and dealing with onrushing enemies with a swift shruiken to their faces. One hit and you’re finished, so the game can be frustrating, especially if you are approaching a yet unexplored area. Foes seem to come from nowhere and can finish you off in a second. Trial and error is therefore a part of the game, and you either love that or hate it. I’m usually against such underhanded tactics, but in this game is seems an acceptable evil. The object of the game is to defeat The Trickster, who has somehow become the mayor of Central City. Now, I know his job is tricking people, but am I to believe that he’s smart enough to convince an entire city to vote him into office, then declare Flash a criminal so everyone is against him? Even for an early-90′s comic story, this is ridiculous. The Flash needs to get through various levels of the city to reach/stop Trickster, so there’s a lot of running and jumping. 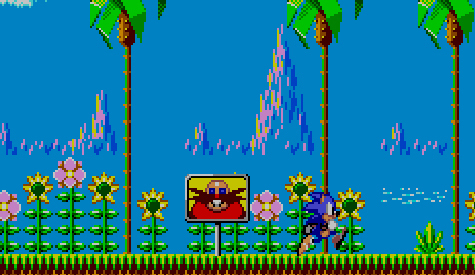 Problem is, while Sonic had this huge, open area….Flash has these little city neighborhoods, and it gets confusing. He really moves too fast to see where you’re going, or sadly, what you’re landing on. Obviously, Trickster’s first order of business was to create huge potholes and spiked-pits throughout…was this the platform on which he ran? Who would have voted for this? As much affection as I have for the Master System, it didn’t really fare too well anywhere except Europe (and Brazil), and its paltry but loyal core of proud and loyal owners were enveloped by the congealing mass of NES owners in Japan and the US. A testament to its failure in the two most important markets is the fact that this very game represented the final official release for the console in Japan, and at a time when the system was only just becoming established here in the UK! 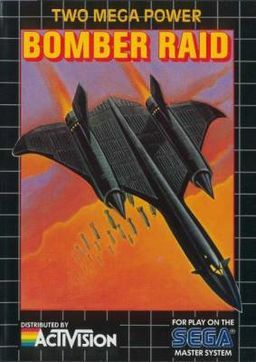 Bomber Raid was released exclusively on the Master System too so there’s a good chance a lot of American and Japanese gamers missed out on it altogether, but did they miss much? And perhaps more importantly, was it a fitting farewell for the lovely little console in its native territory? 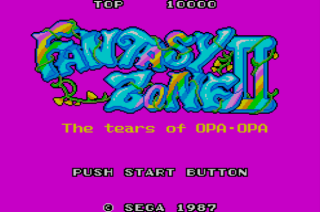 The biggest difference between this and the first Fantasy Zone game is that each round is now divided into several different areas. Destroying enemies still releases coins (and notes now, too) of varying value but some Menon bases leave behind a blue warp instead. These allow you to travel back and forth between the areas, each of which generally contains four or five bases. There is also one base that will leave behind a red warp when destroyed. This leads to the boss but you can’t enter it until all the bases are destroyed. Given the popularity of the Transformers at the time this was released, it’s not hard to see where the inspiration for the main character came from, but I’m not really sure it works too well. It’s at best an under-used gimmick here, but does that make this a bad game? Well, back when my trusty Master System was my main console of choice and its games were freely available in high-street stores, I always steered clear of this game. Every magazine review I saw of the game slated it, despite its cheaper price point. If it was that bad then, it must be terrible now, right? Well, no actually. 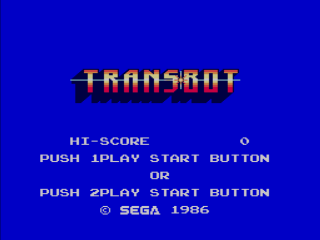 Being both a budget game as well as an early release for the Master System, TransBot is understandably basic, in concept as well as aesthetics, but it’s actually not at all bad, and certainly not as bad as I’ve believed all these years! Luckily, with his eggs trapped on apparently such a hostile planet, Overbite is free to walk and jump around the rounds to his hearts content. A vast majority of the blocks are blue ice blocks. Overbite can break the ice blocks beneath him by pecking them and the egg can then be pushed through the gap. Be careful though – the egg can’t fall more than three blocks downwards without breaking, so you’ll have to take some time to consider which blocks to break. Graphically the game is a bit of a mixed bag. 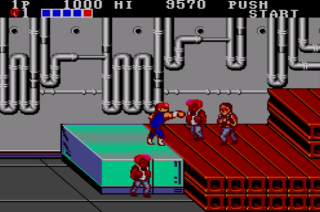 From static screenshots it probably looks like one of the best versions of the game outside of the arcade, and the four stages are nicely varied, consisting of inner-city streets, a factory, a large wooded area, and finally the big boss’ hideout. The sprites aren’t enormously varied but all look suitably thuggish. 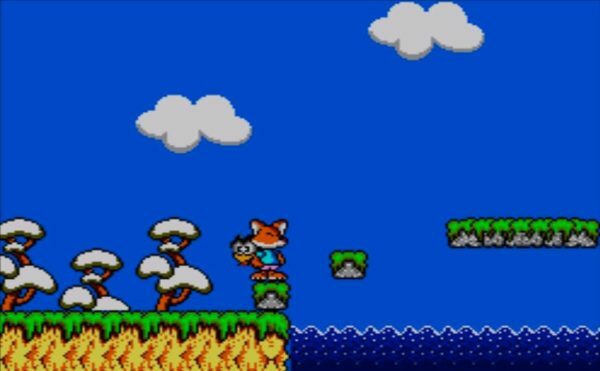 However, the problem is a familiar one for Master System fans – sprite flicker. Lots of it. It’s often easy to overlook this problem with Master System games as it doesn’t usually affect proceedings to any significant degree, but this is one of the worst cases I’ve seen on the poor old MS.
Let’s be frank. 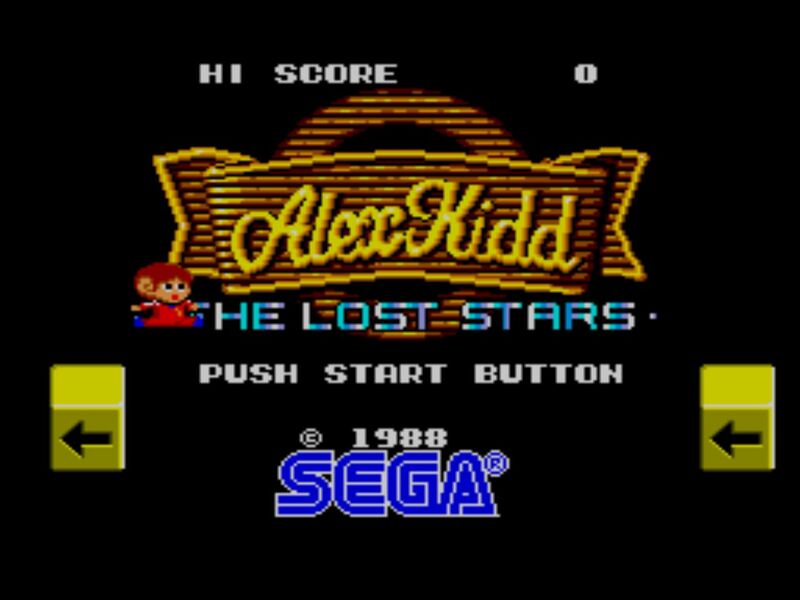 Alex Kidd: The Lost Stars is a very weird and very frustrating platformer from the early ages of the 8-bit era. 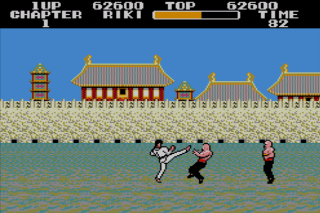 It was one of my first Sega Master System games, and one of the only ones that I could manage to beat. The levels were colorful, the enemies bizarre, and to this day, I’m still not really sure what the hell the story was about.